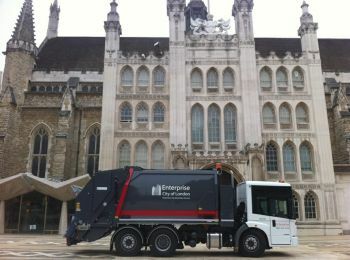 For the first time in the capital’s history Enterprise has equipped its latest fleet of refuse vehicles operating in the ‘Square Mile’ of the City of London with Hard Disk Recording equipment. Since 1992 Enterprise has been providing 24 hour domestic and commercial waste and recycling collections to the City, and Enterprise City of London chose Innovative Safety Systems Ltd (ISS) as the preferred supplier. Innovative Safety Systems Ltd (ISS) has just completed installing the technology to the new fleet, as well as providing training on how to operate the new equipment. The four-camera DVR Hard Disk Recording system from ISS allows for continual service monitoring, so lapses in health and safety best practice by crews can be quickly identified and addressed. Also, any road accidents or events involving members of the public are recorded to allow for quicker investigation and resolution. ISS first worked with Enterprise in 2009 in Gloucester, equipping 12 RCV’s with DVR Hard Disk Recording. The success of that first contract and the benefits of the system were a major factor in Enterprise choosing to invest in the system again.